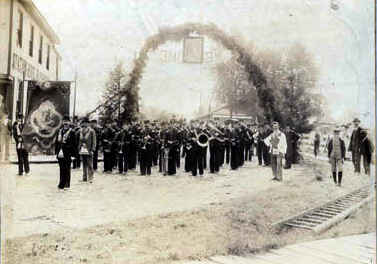 Photo of the Orangemen's Parade of 1887 including celebrations for the Queen's Jubilee. Large cedar arch with photograph Queen Victoria in centre. Haynes Station Hotel can be seen on the left and the Oakville Railway Station in the background. The Haynes Station Hotel was demolished circa 1930. 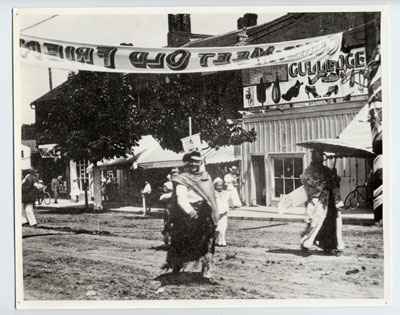 Calithumpian Parade, early 1900s. At South side of Colborne (Lakeshore Road) at George Street with Gulledge's Boots, Shoes and Harness Store to the right. 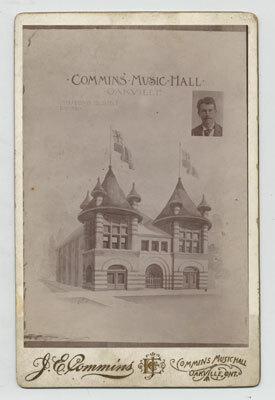 The Commins Music Hall was an imposing building built in 1894 by J.E. Commins, Photographer. It only stood for four years when, in 1898, it burned to ground. Some of the programs which took place at here were Pauline Johnson: Recitations, "The Rivals," "Mrs. Jailey's Waxworks," and "Ten nights in a Bar Room." It is now 283 Lakeshore Road East and is home to Morrison House, formerly Toronto Dominion Bank. 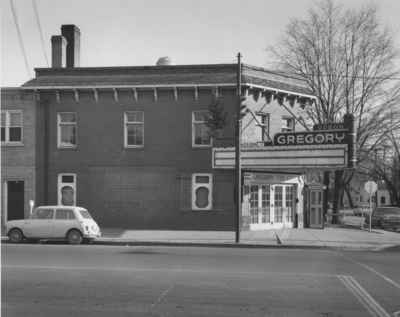 In the early 1920s, the very up-to-date Gregory Theatre was built at 282 Lakeshore East, now home to TD Canada Trust. For over 30 years it was the centre of town entertainment, hosting both stage productions and moving pictures. The theatre was demolished circa 1960.